In order to meet different requirements of users, Mac version and Windows version are all available for downloading. On your different operating systems, please install the application via following the setup wizard. Please see the main interface of the application in Figure 1. When loading PDF files into VeryPDF PDF Stitcher, please click Add button to open file picker window in which you are able to choose PDF documents. This application also supports drag and drop operations which are more convenient for loading PDF files. If you want to remove the loaded PDF, please use Delete or Clear button in the toolbar. You can also right click the added PDF in file list and choose Delete Selected Item (s) or Delete All Item (s) option in popup item. (1). 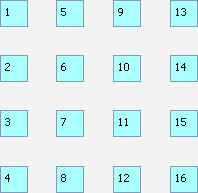 Page order: In Order group box, you can choose four kinds of page order for the stitched PDF page, please see the difference in Figure 2. (2). 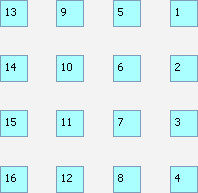 Page row and columns number: In Pages per sheet group box, you can set the row number and column number for stitched PDF page manually. 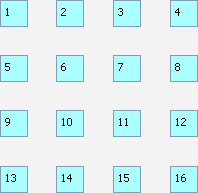 For example, the row and column number in Figure 2 is 4x4. (3). Page margin: In Margin group box, you can set the page margin to the stitched PDF page from left, right, top and bottom. (4). Gutter: If you don't keep each subpage of PDF closely, you can set the gutter for your needs from X and Y directions in Gutter group box. (5). Page range: If you want to stitch different pages in one PDF document to one PDF page, please click Setting button in the toolbar and then choose different options in Range group box. You can select all pages, odd pages, even pages or custom pages manually by following the example. To set page size for stitched PDF page, please click Setting button to open Setting window. In Size group box, you can choose different kinds of page size such as original size, supplied page size, scale percentage or custom page size manually. In Line Color group box, you can specify the line color of the gutter for stitched PDF page. 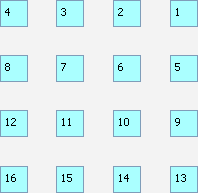 In Rotation group box, there are four rotation angles for your choice: 0, 90, 180, and 270 for the stitched PDF page. Then please click Apply button to save the changes. 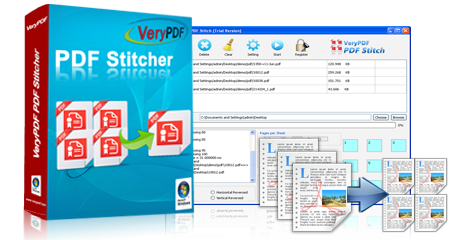 In interface of VeryPDF PDF Stitch, please choose output location in Output Folder edit box by clicking Choose button and stitch multiple PDF pages to one PDF page by clicking Start button. When Result=OK appears in log file window, you can click Browse button beside Choose button to see the target file.